This building was created using only Gears of War assets. It is enterable, and the tower itself has three levels and roof access. 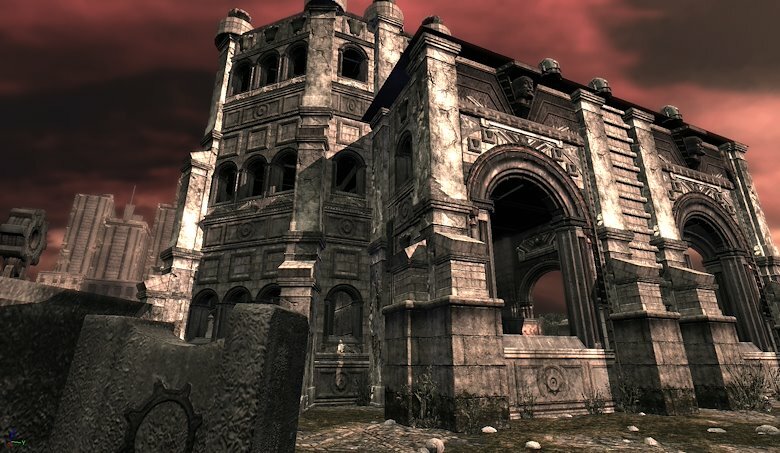 During this level, the player’s allies use the tower as a fire base to lay down covering fire. 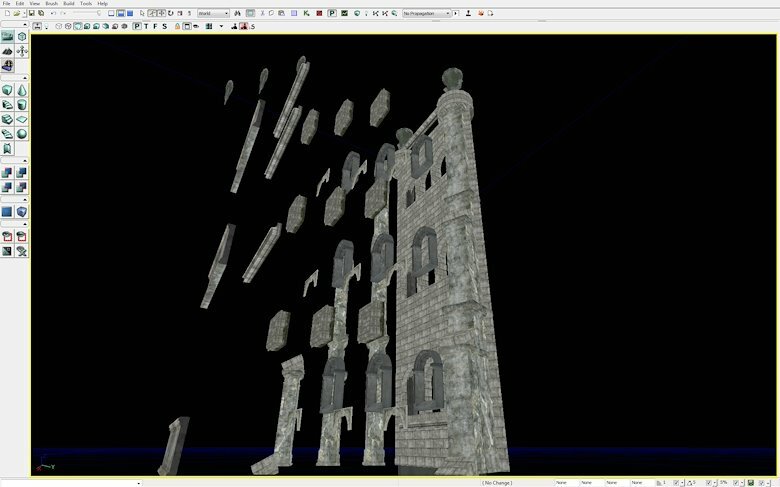 One wall of the tower exploded. Area sinks violently into ground as enemies fire from all directions. 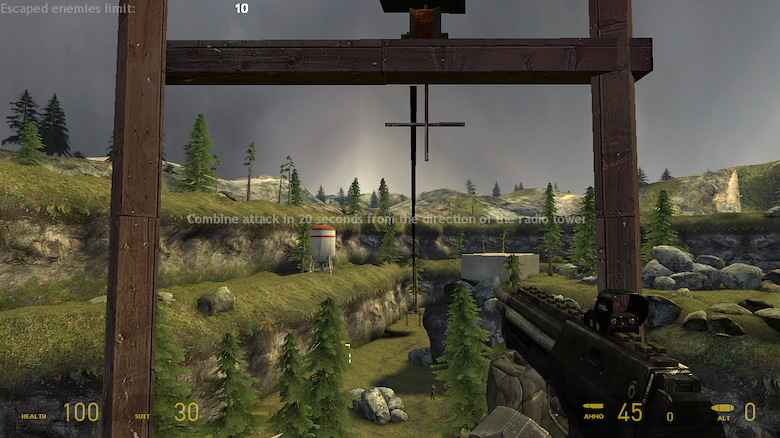 Eventually sinks low enough to allow the player to mantle over ledge and continue on. 2. 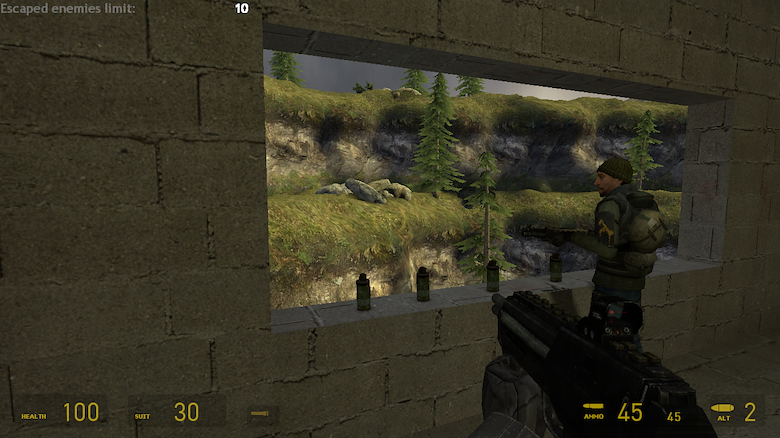 Player goes under the scenic elevated boardwalk that the enemy is using as a firing position. 3. 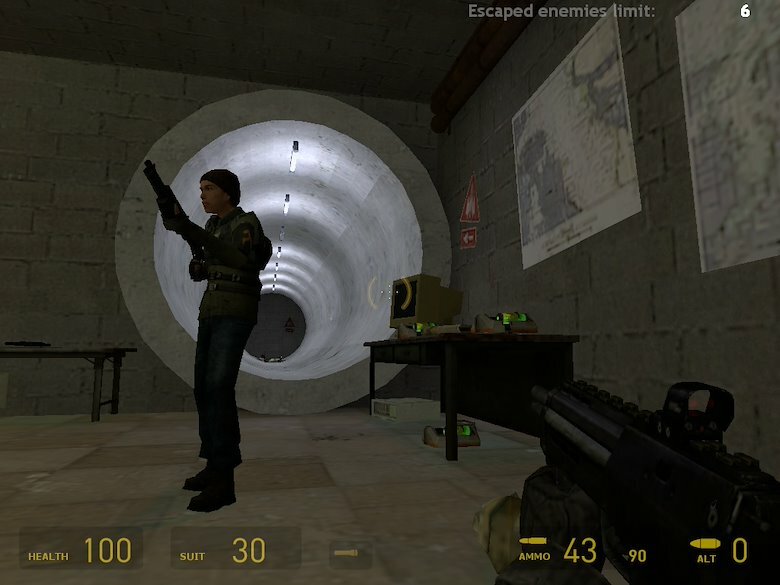 Player emerges from the underpass to find enemies attacking from the stairs on the right. The direct path towards his final destination is blocked by rubble. Player is in a tight spot here, but things get better as the player goes through another underpass and finds a sniper rifle there. 4. 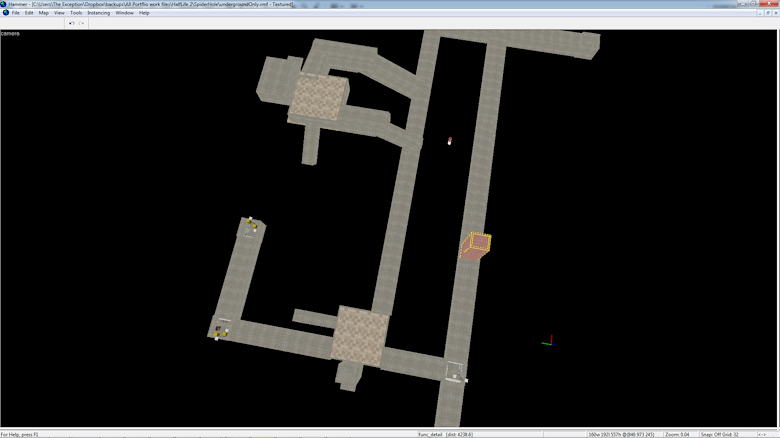 Player can now mount the stairs and take over the elevated boardwalk for his own. Lots of good cover and elevated flanking firing positions give the player opportunity to get revenge on enemies in positions that were harassing him before. 5. 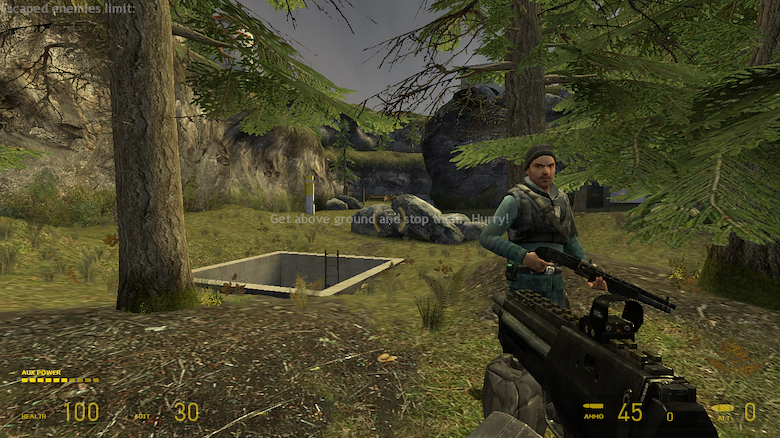 Here the player can pick up some grenades and use them to easily silence an important emergence hole (not pictured). 6. 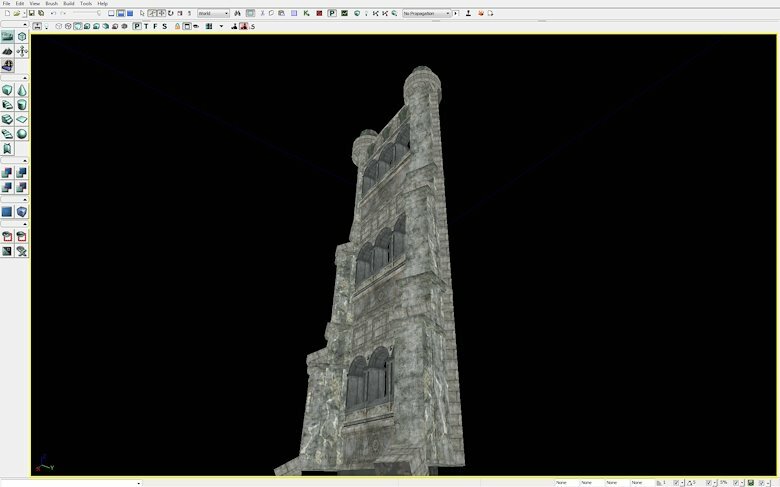 The tower is the players final goal. Inside the tower are teammates. 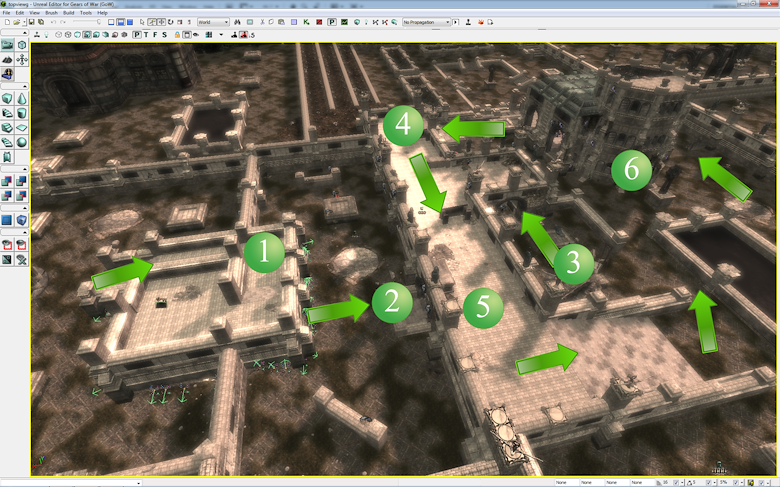 Using the second and third stories of the tower, they can provide covering fire for the player over the entire map. 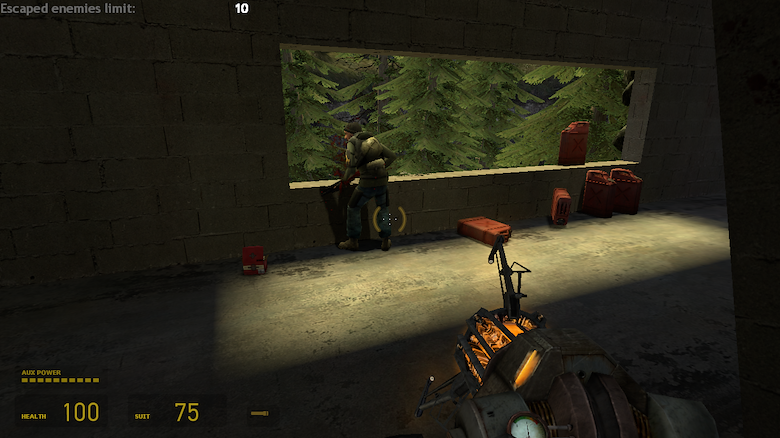 This is a Half Life 2 level with a twist. 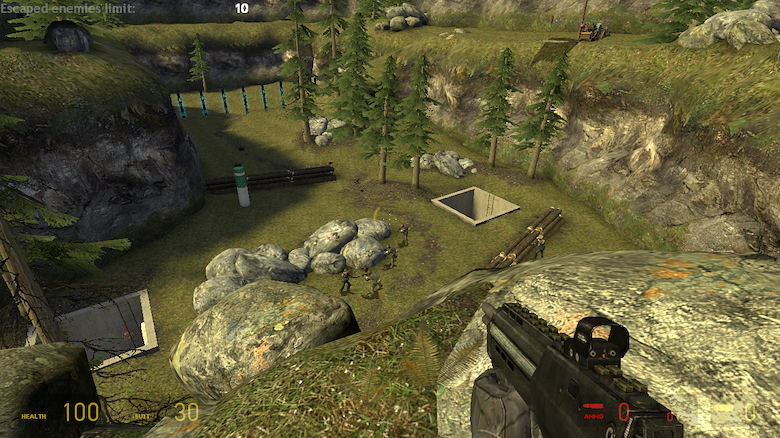 The player and his allies must ambush waves of combine to keep them from reaching the end of the level and escaping. 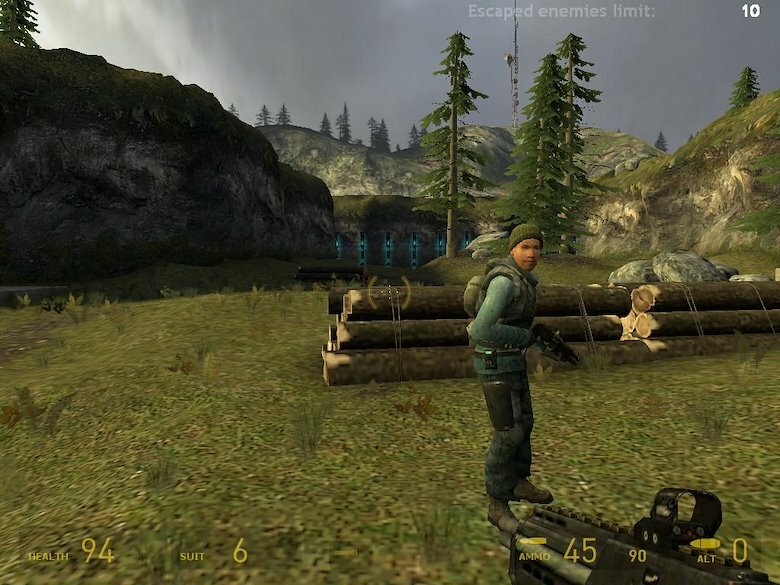 If more than 10 combine escape, the player loses. 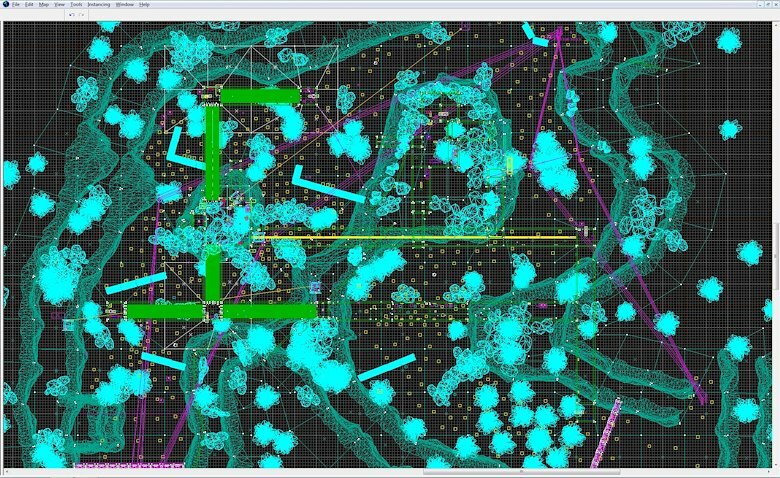 However, the player has access to a rebel tunnel network that provides fast transit all over the level and connects to traps, ziplines, mine stockpiles, elevated cover, and a variety of other advantageous mechanisms and positions. To win this level, the player must constantly make strategic choices and use the tunnels in creative ways. Should he stand his ground and aid his above ground allies, or should he fall back into the tunnels? Or fallback to a better position above ground? If the tunnels, what entrance should he use, and what exit will allow him to get the jump on the enemy? 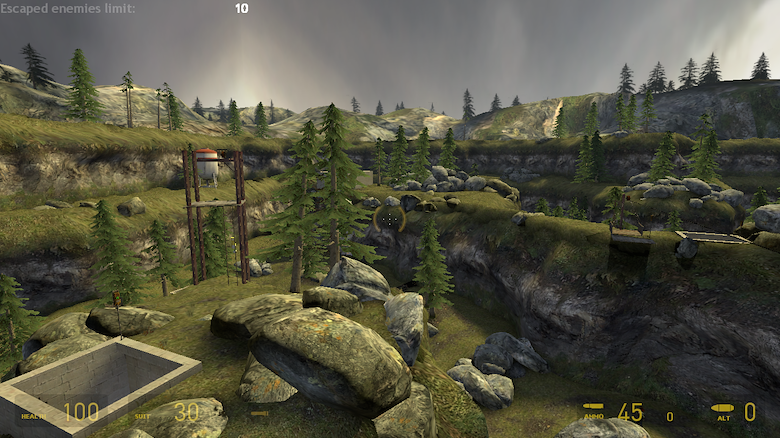 This is a picture of the redesign of this level. Alpha stage. There is an entire tunnel network that you can't see, not just below ground, but in the cliffs as well now. 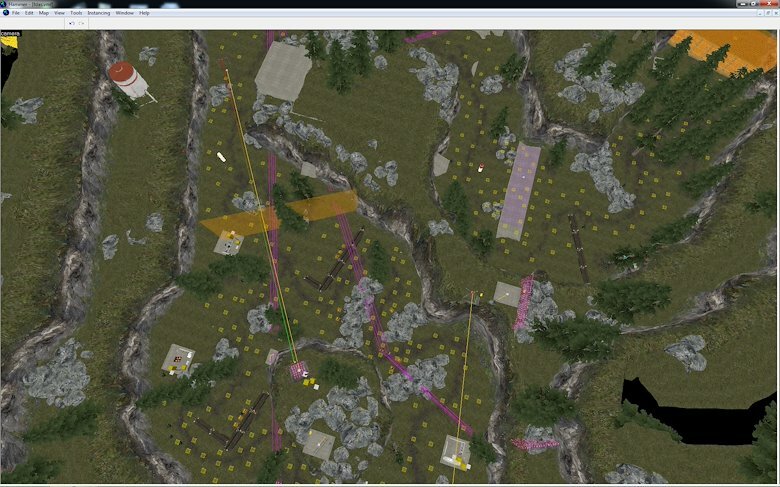 There are zip lines, mine carts, sky ride things: just tons of ways to go around and behind the enemy waves. You can see some of the tunnel network in this picture. 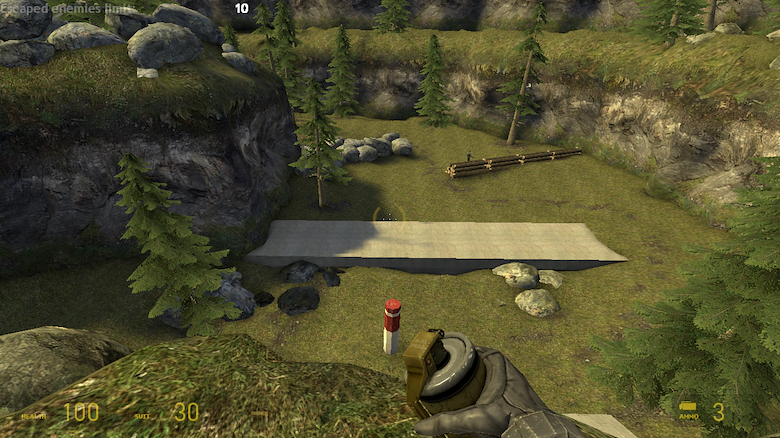 If it seems like there are a lot of path nodes, it is because the player is able to throw up barricades and open hatches in an attempt to block path of the passing waves. A view from the top of the zipline. Flyover view of some of the scenery. One of several elevated firing positions accessible from the tunnel network. 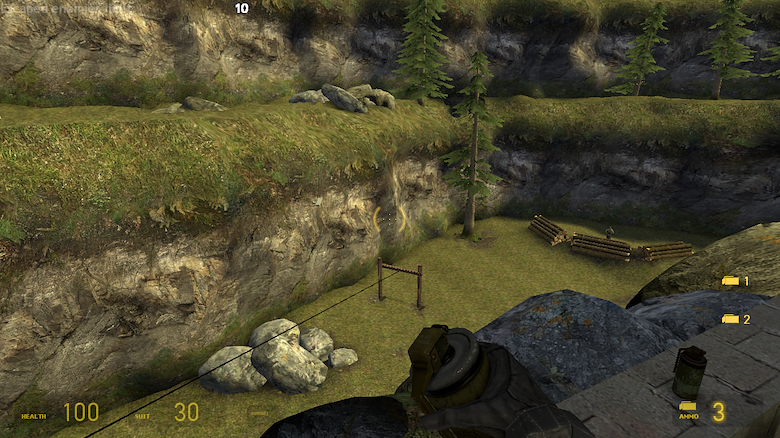 One of many holes that the player can jump down to access the underground tunnel network, resupply, and escape enemy fire. Tunnel layout that exists underneath the layer in the previous picture. This tunnel network is filled with transportation devices, shortcuts, elevated firing positions, supplies, etc. that the player can use to gain a logistical, and tactical advantage. Using the underground tunnel network as well as the above ground transportation options, the player can move to put fire on any part of the level very quickly. Examples of my level creation style.